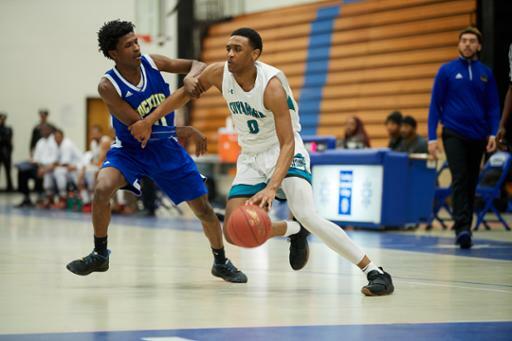 Cuyahoga Community College (Tri-C®) basketball player James Anderson Jr. has been named a 2019 NJCAA Division II All-American, adding to his list of honors following a stellar season. The sophomore forward averaged 16.3 points per game to help lead the Triceratops into the national rankings and to the top of the Ohio Community College Athletic Conference standings. Anderson also contributed 6.9 rebounds and 1.3 assists per game in a season marked with awards and honors. He earned first-team all-conference recognition in March while finishing second in the OCCAC Player of the Year voting. Anderson was also selected to the NJCAA all-district team. Anderson — who is from Roswell, Georgia — will graduate from Tri-C in May with an Associate of Arts degree. The Triceratops finished the season with a record of 25-7, marking the team’s third consecutive 20-win season. Tri-C has finished first in the conference the past three years.